If the doctor feels as though x-rays are needed following the examination, they can be performed immediately on site. If the doctor recommends other diagnostic procedures (i.e. MRI, CT…), an appropriate referral will be made. Digital X-rays: in this office we use digital X-rays technology. Time efficiency and produce an image of better contrast to conventional radiography. After viewing the X-rays, the doctor can be able to determine if you have arthritis, disc degeneration, spinal misalignment or other pathologies. Chiropractic Adjustments: gentle manipulations of the spine or other joints. To restore joint mobility by applying a controlled force into a joint that is restricted in its movement. By restoring proper motion to a joint that is not functioning properly, the mechanics and nervous system will be improved. 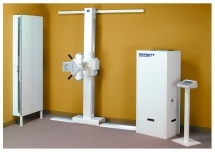 Spinal Decompression: in this office, we use “SpineMed” technology. The spinal decompression works by stretching the spine to increase disc spaces, to restore nutrients flow to the discs and to take pressure off nerves. A revolutionary new treatment for degenerated or, bulging Disc. Safe and very effective for sciatica and other pinched nerves which have resulted from disc herniations, and bulges. Traction Therapy: The Traction therapy used to induce passive motion into the spine for the purpose of stretching spinal joints and increasing mobility. This therapy can be applied with or without vibration. Muscle Stimulation: to reduce pain, decrease swelling, decrease muscle hypertonicity to promote blood flow and helps to speed up the healing process. Ultrasound Therapy: is the speeding up of the healing process from the increase in blood flow in the treated area. The therapy also helps to decrease pain from the reduction of swelling and edema. Acupuncture Therapy: Acupuncture is an element of Traditional Chinese Medicine (TCM) that originated in China more than 2,000 years ago. It is one of the oldest and most commonly used medical procedures in the world. Based on natural law and energy, acupuncture is a complex system of diagnostic corollaries that treat the person as a whole rather than only focusing on specific isolated symptoms. Acupuncture treatment involves stimulation of points on the body by penetrating the skin with metallic, hair-thin needles. Needles placed into the body vary in amount and depth reached. Each needle can stay in place for as long as an hour, but the typical time length is approximately 25 minutes. Our Clinic offers the highest quality acupuncture treatments in a clean and relaxed setting. Contact us for more information about acupuncture therapy. Massage Therapy: to promote relaxation and increase circulation in the body’s soft tissues (muscles, tendons, connective tissue, etc.). Posture Correction: this is achieved through a series of posture specific chiropractic manipulations, exercises and tractioning procedures. Nutrition/Vitamins Recommendations and Supplements: a balance of structural and chemical well being are imperative to obtain optimal health. The structural elements are addressed with chiropractic care while the chemical elements are addressed through dietary and supplements recommendations.